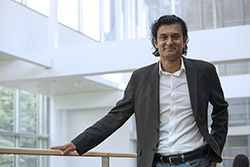 Navdeep S. Chandel, PhD, professor in Medicine-Pulmonary and Cell and Molecular Biology, and collaborators show that metformin inhibits mitochondrial complex I in human cancer cells to reduce tumor burden. Northwestern Medicine scientists have demonstrated how metformin, a drug widely used to treat patients with type II diabetes, inhibits cancer progression. Recent studies suggest that the anti-diabetic drug prevents cancer progression, but how metformin diminishes tumor growth is not fully understood. Metformin works by decreasing insulin in the blood. It is postulated that since cancer cells need insulin to multiply, the drug slows down tumor growth by cutting the energy supply produced by their mitochondria. Navdeep S. Chandel, PhD, professor in Medicine-Pulmonary and Cell and Molecular Biology, and collaborators showed that metformin inhibits the function of mitochondrial complex I in human cancer cells, which reduces tumor burden. Mitochondrial complex I is a compound central to energy production in the cell. First authors are William W. Wheaton, graduate student in Walter S. and Lucienne Driskill Graduate Training Program in Life Sciences, and Samuel E. Weinberg, MD/PhD student in the Medical Scientist Training Program. The paper was published May 13 in eLife. They studied the effects of metformin on cancer cells by using tissue cultures to measure oxygen consumption and mouse models to observe tumor growth. The team discovered that when glucose is abundant, metformin slows down the rate of cancer cell division, but when cells are deprived of glucose, metformin kills the cancer cells. The researchers also found that metformin inhibits the pathways that regulate a system that helps cells to survive low-oxygen conditions. “Our study shows that metformin inhibits mitochondrial complex I to diminish the tumor burden,” said Chandel. “We suggest that metformin may stop tumor progression more effectively when used alongside other therapies that reduce the availability of both oxygen and glucose inside cells. Chandel also plans to continue studying how metformin works when administered with other cancer therapies. The study was funded by National Institutes of Health grants RO1CA123067, T32GM08061, and T32HL076139.